There’s something about the ocean that draws people. The sights, the smells, the tranquil and awe-inspiring feels. All of it. And the same goes for aquariums. Kids and adults alike love aquariums. And that’s because they offer an up close and personal view of all the things you don’t usually get to see during your typical visit to the beach. Yeah, the sand and water are great. But if you want to see marine life up close and personal, you have to visit an aquarium. There are several across the United States worth visiting. But, inside this post, we will talk specifically about some in the Southeast region to get you started. Inside the Inner Harbor in Baltimore, you will find lots of great shops, even greater food, live music- and one gigantic non-profit aquarium on a mission to promote aquatic conservation. Sure, the National Aquarium has a lot of stuff you’d expect to see at any other aquarium. But with over 20,000 animals, you can bet they also have a few other things the kids haven’t seen before: like burrfish, live jelly cams, and a one-armed sea turtle. There’s much to do in Gatlinburg. And Ripley’s Aquarium is one of them. Don’t pass by without going inside. 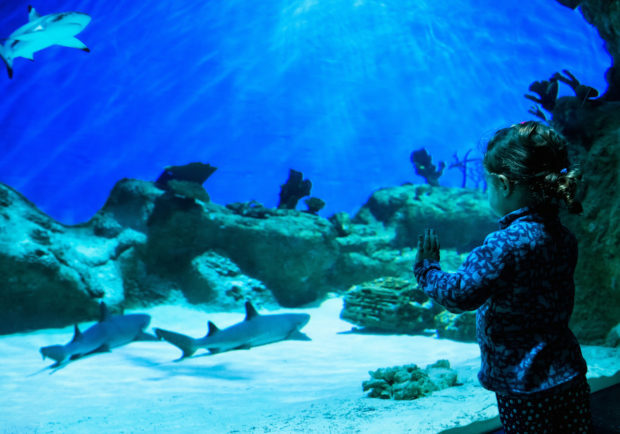 There’s a ton for the kids to explore, including a penguin exhibit with a crawl through tunnel, an even bigger underwater shark tunnel, a stingray and horseshoe crab petting area, and a multi-level playground. The Georgia Aquarium is said to be the largest, most well designed, aquarium in the world, housing tens of thousands of animals in over 10 million gallons of water. WOW. What more is there to say? Stop in and say hello to their whale sharks, beluga whales, sea lions, manta rays and more. Epcot inside of Disney World is one of the best (and probably most underrated spots) for kids in all of Orlando. And that’s because it’s thought to be for adults. But that’s not all true. There are secret missions, character meet and greets, interactive games at Image Works, water fountains, fireworks, and one spectacular aquarium: The Seas With Nemo & Friends. Kids can walk all the way inside and find themselves completely surrounded by coral, sharks, dolphins, and fish of every kind of color. Then they can learn fun facts about marine life and hop on a Nemo ride. New to the block: This aquarium doesn’t have a dolphin or orca show, but it does have 5 stories filled with different hands-on things to do. There’s an observatory deck overhead where little ones will get a kick out of watching live feedings or dipping their hands into touch pools. There’s a planetarium with 3D shows, an interactive building block area, a playground, a dance floor, and a massive indoor viewing glass. Speaking of that dolphin and whale show. If you’re in the Miami area, you have to visit the 38-acre Miami Seaquarium. It’s been in operation since the 1960s and is a Miami landmark. It’s also where the classic TV show Flipper was filmed. The kids won’t know who that is, but mom and dad will! Not all aquarium-ed out yet? Pfft, us either! We’re ready for more fun: Check out these other posts for a list of some in the Northeast and Midwest.